Boot scrapers came into being at the same time as footpaths and flourished in the 18th and 19th-century streets of Belgium. This was also the same time when people discovered a taste for strolling and when shoes became fit for walking outdoors. Boot scrapers used to line the footpaths until the 1840s when they were ordered off the streets for public safety and fixed in the front doors of most Belgian houses instead. The French called this early version of doormats as decrottoir, which means the need to remove excrement. These mats look great both in and outside of your home. Because they are flat, they aren’t going to a do a great job cleaning the side of your boots, although some people will twist their feet to try to remove mud from the sides. They come in a lot of design and take up more space than other types of boot scrapers. This type of boot scraper is not only incredibly durable, but is going to do a great job cleaning the bottom and sides of your boots. They have a lot of bristles that are going to be able to get into any crevices in your boots to remove dirt that is stuck there. These scrub brushes are perfect when you need a really deep clean. Cleaning brushes are very similar to scrub brushes, but don’t offer quite the cleaning and scrubbing power that the other does. They do clean the bottom and sides of your boots and do a great job removing both fresh and dried on dirt and mud. A scraper mat can come in many different designs and styles, but will give you a place where you can scrape off the bottom of your boots and shoes. They generally are a little better at cleaning your boots than door mats do, but since they don’t clean the sides, they don’t get at the whole boot. Metal boot scrapers are among the most simple of the designs. Usually formed out of a single piece of metal, they are incredibly durable and difficult to damage, no matter how long they’re in use. Because they do not come with material on them that will be able to get into the nooks and crannies of your shoes or boots to remove dirt and debris, you have to rely on a hard edge of the scraper to remove your dirt and mud. This means that a metal boot scraper is much better suited to removing thick mud from the bottom of a boot than it is removing a lot of mud and dirt that is stuck on the side of the shoe. These boot scrapers come in a lot of different styles and themes, making it easy to find one that matches with your décor or personality. Rubber boot scrapers are generally fairly easy on the floor, so you don’t have to worry about it sliding around and scratching up your porch or your entryway. They often feature more intricate designs than what you are going to be able to find with coir. When looking for a rubber boot scraper it’s a good idea to consider a tray that has the scraper built into it. This will allow you to not only scrape off your boots and shoes when it’s time to come inside, but will give you a place where you can leave them. Since they have deeper walls that can hold in any debris, you won’t have to worry about dirt getting all over your home when you opt for this type of boot scraper. This type of boot scraper can be taken outside and hosed down, and then left to dry in the yard or on the driveway before being brought back into the home. Boot scrapers that are made of coir are incredibly durable and have been built to last for a very long time. They are made of coconut fiber, harvested from the husks of coconuts, and this material will last. It is waterproof and won’t become damaged or moldy if it is left with water sitting on it for an extended period of time, which makes it ideal for use outside. These boot scrapers consist of thick crests where the boot can be rubbed to remove the dirt and debris stuck on the boot. Because the coir is so strong, it will be able to get into the small crevices on boots and remove any dirt there without missing spots. Additionally, a benefit of this type of material is that the coir is so tightly woven that it holds onto any debris that it removes, so you don’t have to worry about transferring your mud to the next person. It’s easy to clean out a coir boot scraper, and this can be done by either vacuuming out the scraper to remove dried dirt or shaking and then sweeping it. The antique look is becoming more popular, and if you want to enjoy a boot scraper that works as well as newer boot scrapers but has a more interesting look then opt for one that is an antique. It’s important to remember that when you are looking for an antique boot scraper that you’re going to be choosing from ones made out of metal, as these are the ones that will have best survived for many years. Because they are both functional and decorative, they’re a fun way to scrap your boots. 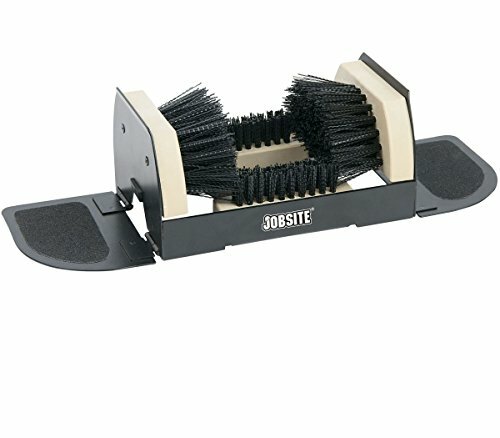 When you’re in a hurry and don’t want to have to spend a long time repeatedly running your boots through the scraper to get them clean then you will want to opt for a boot scraper that has angled brushes. This will allow the brushes to reach all areas of your boot without any problems so that you don’t have to spend your time moving your foot around to clean all sides of the boot. This means that you can easily and quickly clean your boot and enter your home without a lot of delay. While the time saved with angled brushes may not seem like much, if you have a number of people in your home then you will definitely want to opt for this feature, as it will make it much easier to get all of your family members back into your home in a timely manner. Being able to pay a lot of attention to your boot while you are getting it clean and taking up a smaller space on your porch are the benefits of boot scrapers that only have a spot for one shoe at a time. These are going to be half the size of double boot scrapers. If you have limited space on your porch for a boot scraper then it’s best to opt for one that only cleans a single boot at a time. While this will take a little more time, you won’t have to worry about your entire porch being monopolized by a boot scraper and can rest easy that you didn’t overspend. In general, you can buy single boot scrubbers that have more bristles and will do a better job deep cleaning your boots, so if you want incredibly clean boots or work outside a lot, then opt for a single scrubber. Homeowners who are more concerned with being able to scrub off their boots quickly and easily will benefit from a boot scrubber that has a spot to clean both boots at once. Obviously, these boot scrubbers are going to be twice the size of ones that only clean a single boot at a time, but they will allow you to quickly scuff your feet on them and keep on going. 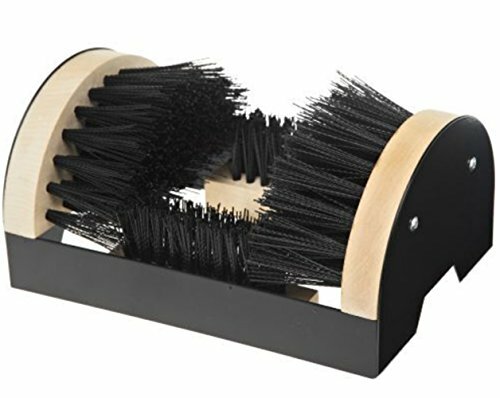 These boot scrubbers are best for quick passes with your boots but won’t usually have the thick bristles up the sides that will be able to deep clean your boots for you. Perfect for a larger family, when you buy your boot scrubbers in a pair or in a set then you won’t have to worry about not being able to clean your boots when you want to get into your home. This also ensures that your entryways will have a coordinated look. Some homeowners opt to have both boot scrubbers at the same door so that everyone can easily enter at once, while others prefer to split them up to different entrances in their home. Whatever you choose, when you buy your boot scrubbers in a set then you won’t have to worry about the way they look. Your home and patio will look put-together and thought out. 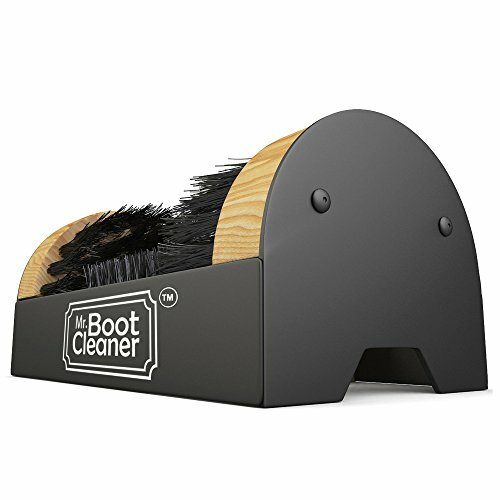 While many people want to be able to move their boot scraper from one area to another as they see the need, if you want to make sure that your boot scrubber doesn’t move, no matter how hard you scrub your foot to get your shoe clean, then you will want to opt for one that has a permanent mount feature. This will allow you to quickly and easily mount your boot scrubber in a location that you can easily access, and since it won’t move, you can scrub as hard as you want. This really is ideal if you tend to get your boots and shoes incredibly dirty, as you won’t have to worry about your boot scrubber moving away from you while you are using it. 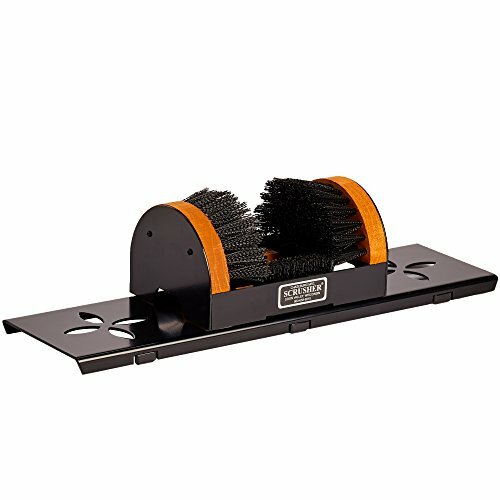 Instead of getting frustrated because it keeps slipping out of the way or because you keep having to move it back to its original location, when you opt for a boot scrubber that can be permanently installed in a location you won’t ever have to worry about it moving or having to chase it across your porch. If you’re not ready or willing to make the commitment of installing your boot scrubber in a permanent location then you will want to opt for one that is moveable. This will allow you to relocate your boot scraper if it ever gets in the way or you decide that you want it at a different entrance to your home. The problem with this type of boot scrubber is that when you use it and push against it, it will often slide around on the porch. This isn’t just frustrating – it can also make it very difficult to get a complete and thorough clean on your boots. For this reason, if you are going to opt for a boot scrubber that is movable, you may benefit from choosing one that is wide enough so that you can hold it down with your other foot while using it. This will allow you to clean your boot without it sliding around since the pressure of your other foot will be able to hold it in place. While this may not seem ideal, it’s much better than chasing the scrubber around on your porch or committing to installing it permanently in a certain location. Many people shy away from buying boot scrubbers that are labeled as being “extra wide” because they don’t think that their feet are that big. Unfortunately, when you fail to take into consideration the size of your boot then you may have problems getting your boots as clean as possible. If you are opting for a boot scraper that will come up the sides of your boot and not just clean the tread then you will want to consider buying one that is extra wide. This will make it easy for most people to clean their boots. If you do not buy one that is extra wide and can’t quite get your boots into it to easily clean them then you are less likely to actually use it the way it was intended. Not being able to fit your boots in to the boot scrubber is really frustrating and will likely cause you to skimp over your cleaning, leaving a lot of mud and debris on your boots. Outdoor boot scrubbers are really useful because they allow you to remove the junk and mud on your boots before you enter your home. This is a great way to keep your home as clean as possible and to ensure that you don’t track in. When you are in the market for an outdoor boot scrubber you will want to make sure that you buy one that is clearly labeled as being for outdoor use. Unfortunately, if you use some indoor boot scrubbers outside they will quickly fall apart because they have not been built to stand up to the elements. Outdoor boot scrubbers will fit neatly onto your porch so you can clean your boots off and will stand up to rain, extreme hot and cold, and even UV rays if you leave them out in the sun. Indoor boot scrubbers aren’t generally going to be as heavy-duty as the ones that you use outside, since they are not built to stand up to foul weather. Additionally, they aren’t going to offer as deep of a scrub or a clean since most people do not want all of that dirt and debris knocked off inside their home. 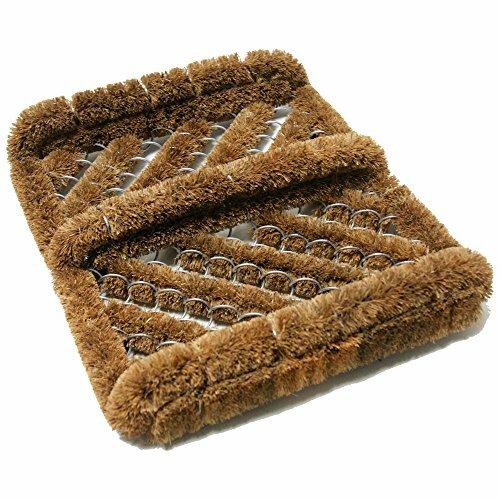 When you buy an indoor boot scrubber you are most likely looking at a flat mat that will rest right inside your door and allow you to scuff off the bottoms of your shoes when you are entering the home. While these are really useful, they won’t provide the deep clean that you may need. Additionally, they are not as durable as ones that can be used outdoors. For the ultimate in flexibility, opt for a boot scrubber that is rated to go not just inside your home, but also outside. This ensures that no matter where you want your boot scrubber to be, you can leave it there without any problems. Depending on the type of scrubber that you choose and how much dirt and mud it is going to remove from your boots, you may want to leave this indoor/outdoor option in the garage, barn, or outbuilding so that you don’t have to worry about piles of dirt inside your actual home. They also work very well in mud rooms where the debris can easily be swept up. 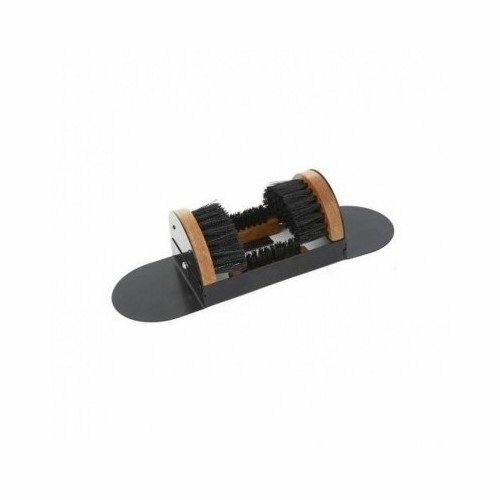 A great way to make sure that your boot scraper isn’t going to slide around when you are using it and to keep it from taking up room on your deck is to install one that fits into the ground. These have two spikes that allow the user to push them into the ground, with the straight metal edge facing up. Boots and shoes can easily be scraped against that metal edge, allowing people to remove any dirt and leave it out in the yard. This will prevent dirt and mud from falling on your porch and you won’t have to sweep it off. If you want your boot scraper to be something that you enjoy looking at then you may want to consider a theme for it. One of the most popular types of boot scrapers that you can buy are ones that are made in the shape and design of animals. It’s easy to find your favorite dog, birds, or even insects and use them on your porch as your boot scraper. When you do this you not only get the utility of a great boot scraper but will have a piece of art on your porch that can actually match the rest of your décor. These make a great gift for someone if you want to give them a boot scraper in the shape of their favorite animal. Just because you want to decorate for the holidays doesn’t mean you shouldn’t have a boot scraper out on your porch. Holiday-theme boot scrapers are a little more difficult to find, but are incredibly useful as they will allow guests and visitors to your home to remove any wet snow or mud that is clinging to their boots. Because they can be hosed off and vacuumed, you won’t have to worry about the design being ruined by dirt and mud. For a simple look but one that will add a little visual interest to your boot scraper, opt for one that has shapes and patterns as the designs. Not only will these look interesting, but the shapes and patterns have the added benefit of producing more surface area across which to scrape your boots. When you use a boot scraper with patterns on it, if the patterns are raised then it will make it a lot easier for you to get the deep clean on your boots or shoes that you need. 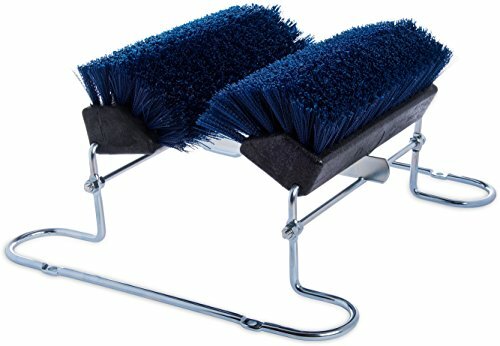 Boot scrubbers that are oval are generally smaller and fit easily into any place on your porch. Look for one that has side scraping abilities as well, so you don’t have to worry about tracking into your home when you do go inside after cleaning off your boots. Rectangle boot scrapers are really popular and this shape will fit in any place on your porch or right inside your home. When you opt for a rectangular mat you will be able to leave your boots on it after they have been cleaned because of its larger size. The half-moon shape is very classy and will add a touch of elegance to your porch while still making it really easy for you to clean your boots. This boot scraper is generally pushed up to the door. The screen door can open out over it, making it easy to scrub your boots before entering.